Bhubaneswar-based Kalinga Institute of Social Sciences (KISS) emerged champions in the 13th PVR Murthy Memorial Inter-School Cricket Tournament, defeating DAV School, CDA, Cuttack in the final by 96 runs at Bhubanananda Orissa School of Engineering (BOSE) ground in Cuttack today. Former India stumper and National Selection Committee chairman Kiran More graced the closing ceremony as chief guest and handed over the trophy in the presence of Union Sporting Club secretary Pradeep Chauhan. Fencing Para OlympianRakhal Kumar Sethi was given a cash incentive of Rs 75,000 on the occasion. Organised by Union Sporting Club, the tournament was earlier inaugurated by SCB Medical College Assistant Professor (Surgery) Manoranjan Mallick in the presence of Union Sporting Club secretary Pradeep Chauhan. INDIVIDUAL PRIZES: Best Young Cricketer of the Year: Sekhar Majhi. Emerging Cricketer of the Year: Mangesh Chaudhury (Odisha Police HS). Best batsman: Saideep Mohapatra (DAV, CDA). Best bowler: Sahil Ullah (Cambridge School). Best wicketkeeper: Navidatya Mallick (KISS). Man of the tournament: Enaas Sabar (KISS). April 10 (Match No 1, PQF): Stewart School 140/6 in 25 overs (Om Narayan Bhadra 42, Jerel Joseph Lonel 17, Prachit Paranjay 17; Mangal Mani 2/17, Afraz Khan 2/25) lost to SCB Medical Public School 142/2 in 22 (Aman Mohanty 62, T Vijay 57; Aryan Samantaray 2/41) by 8 wkts. Player of the Match (PoM): Aman Mohanty. April 11 (Match No 2, PQF): New Stewart School 160/9 in 25 overs (Dev Karnani 62, Sahil Khan 27; Satyajit Naik 2/27) beat Ranihat High School 150/7 in 25 over (Satyajit Naik 32, Rudra Madgul 26; Sanjay Khan 3/32) by 10 runs. PoM: Dev Karnani. April 12 (Match No 3, PQF): Sayed Seminary School 102/10 in 17.5 overs (Tajesh Rao 33, Abdul Sharik 33; Sarfaraz Khan 4/13, K Kiran Kumar 3/23) lost to P M Academy 103/7 in 16 overs (Sarfaraz Khan 26; Sk Latif 3/21, Sk Abes Bux 2/23, B Vishal 2/30) by 3 wkts. PoM: Sarfaraz Khan. April 13 (Match No 4, PQF): Railway Settlement School 37/10 in 11 overs (Suryakant Naik 19; Sahil Ullah 2/5) lost to Cambridge School 39/1 in 7.3 overs (Hetesh Behera 15; Satya Narayan Samal 1/20) by 9 wkts. PoM: Sahil Ullah. April 14 (Match No 5, PQF): Delhi Public School 158/8 in 25 overs (Tanay Biswal 38, Zinasu Pradhan 26; Sayed Asif Ali 3/26, Binayak Sahoo 3/28) beat Jobra Municipal High School 140/8 in 25 overs (Abhisek Behera 48, Sonu Nayak 26; Aman Maity 5/22, Sumeet Patra 2/10) by 18 runs. MoM: Aman Maity. April 15 (Match No 6, PQF): Ravenshaw Collegiate School 117/10 in 24.1 overs (Kamalalochan Senapati 20; Madan Das 4/14, Sohaib Khan 3/23) lost to Odisha Police High School 118/5 in 23 overs (Mangesh Choudhary 39, Prasant Gamanga 36; Omkar Das 3/13) by 5 wkts. PoM: Mangesh Choudhary. April 16 (Match No 7, PQF): KISS, Bhubaneswar 266/7 in 25 overs (Navidatya Mallick 76, Ramesh Meleka 71, Salman Salpadia 45; Pullav Parshiv Sahoo 3/43, Rahul Majhi 3/59) beat Saraswati Sishu Mandir, Mahanadi Vihar 37/10 in 14 overs (Rohit Gamango 5/4, Rajin Mallick 2/4, Chiku Pradhan 2/14) by 229. MoM: Rohit Gamango. April 17 (Match No 8, PQF): DAV Public School, CDA 235/5 in 25 overs (Prince Sanket Behera 113, Saideep Mohapatra 43; Subham Behera Subasish Behera 1/24) beat Secondary Board High School 129/10 in 19.2 overs (Subham Behera 35, Sonu Nayak 25; Diptansu Das 3/15, Pratyush Das 3/26, Saideep Mohapatra 2/16) by 106 runs. PoM: Prince Sanket Behera. April 18 (Match No 9, QF-1): Delhi Public School 130/10 in 24.3 overs (Arihant Pattnaik 40, Punya Mohanty 20; Sohaib Khan 3/25) lost to Odisha Police High School 132/2 in 23 over (Aditya Kr Das 67; Aman Maity 1/17) by 8 wkts. PoM: Aditya Kr Das. April 19 (Match No 10, QF-2): Cambridge School 179/8 in 25 overs (Akash Sarkar 37, Swatik Baral 37; Akash Singh 1/19) beat New Stewart School 81/10 in 16.1 overs (Nitish Kaushik 2/7, Dev Das 2/10, Abhinab Mishra 2/35) by 98 runs. PoM: Abhinab Mishra. April 20 (Match No 11, QF-3): KISS 160/6 in 25 overs (Enash Sabar 66; Pritam Kr Das 2/26, Aman Mohanty 2/27) beat SCB Medical Public School 35/10 in 16.3 (Enash Sabar 3/9, Mahendra Madhi 3/9, Muna Mallick 2/7, Ramesh Meleka 2/2) by 125 runs. PoM: Enash Sabar. April 21 (Match No 12, QF-4): DAV School 220/5 in 25 overs (Saideep Mohapatra 92, Prince Sanket Behera 40; Sarfaraz Khan 2/46) beat PM Academy 74/10 in 15.3 overs (Nizam Khan 18; Pratya Pritam 3/18, Aryanshu Satpathy 2/3, Suraj Behera 2/19) by 146 runs. PoM: Saideep Mohapatra. April 22 (Match No 13, SF-1): KISS 174/7 in 25 overs (Enash Sabar 46, Ramesh Meleka 29; Sahil Ullah 4/22) beat Cambridge School 90/10 in 19.5 overs (Avinab Mishra 21; Muna Mallick 2/9) by 84 runs. PoM: Enash Sabar. April 23 (Match No 14, SF-2): DAV School 185/7 in 25 overs (Saideep Mohaptra 37, Sambit Sahoo 35, Sasang Rungta 33; Binayak Mohanty 2/33) beat Odisha Police High School 115/8 in 25 overs (Binayak Mohanty 31; Pratya Pratim 3/18, Pratyush Das 2/17) by 70 runs. PoM: Sasang Rungta. April 26 (Match No 15, Final): KISS 184/4 in 25 overs (Muna Mallick 56, Enaas Sabar 36, Ramesh Meleka 27; Pratya Pratim Kuanr 1/14) beat DAV School 89/10 in 22.2 overs (Suraj Behera 21, Muna Mallick 3/23, Ennash Sabar 2/13, Rohit Gamango 2/15) by 95 runs. PoM: Muna Mallick. 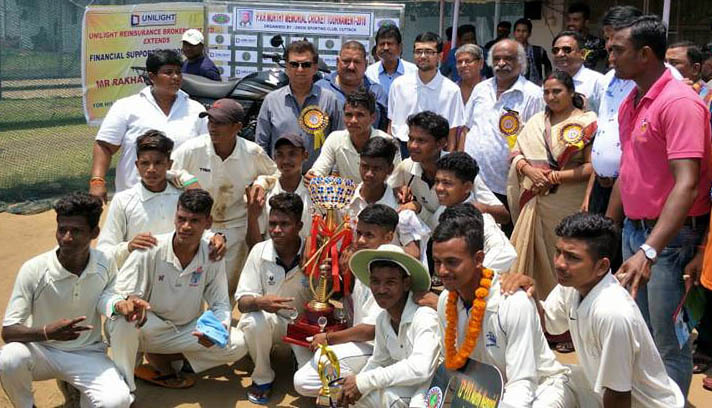 TOP: KISS boys pose with chief guest Kiran More after emerging champions in Cuttack on April 26, 2018. 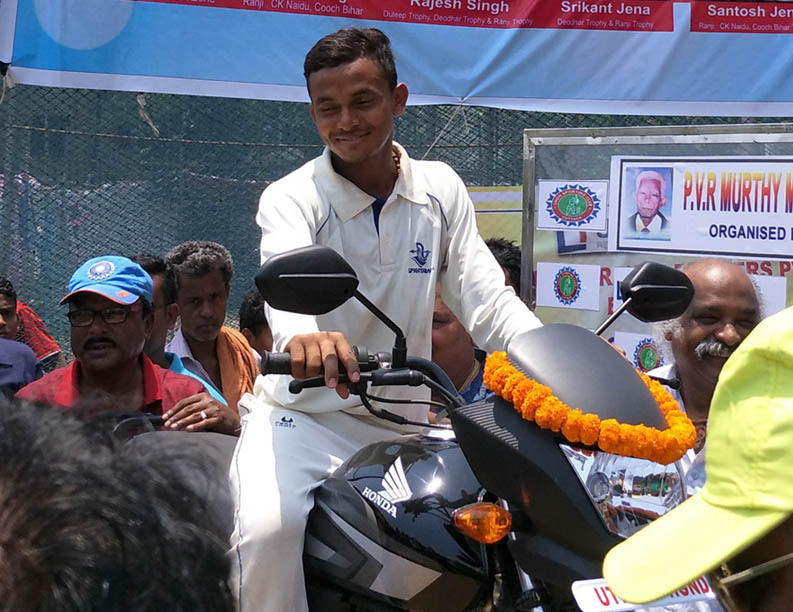 RIGHT: Player of the tournament Enaas Sabar with the motorbike he received as prize in Cuttack on April 26, 2018.